Ganache is a baking staple! It’s used for everything from making drips for cakes, creamy frostings for cupcakes, frostings, fillings and chocolate glazes. 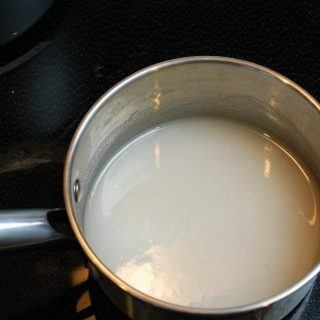 Heat your cream on the stovetop until steam just begins to rise from the surface. Whisk occasionally to prevent burning which tastes really bad. Don’t walk away or your cream could boil over. Pour your hot cream over the chocolate and push the chocolate down so it’s all under the surface of the cream. Let it sit for 5 minutes. 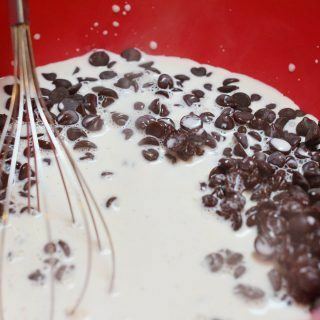 Whisk the cream and chocolate together until it’s smooth. Start with small circles in the center until the chocolate and cream start creating an emulsion. 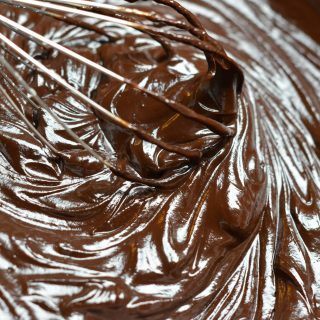 If you have lumps or un-melted chocolate you can use an immersion blender to make your ganache super creamy and lump-free. Chocolate contains cocoa butter. Cocoa butter is like wax, it’s firm at room temperature and liquid when warm. Adding liquids like cream to melted chocolate will inhibit the chocolate’s ability to set firmly. The more liquid you add the softer your ganache will be at room temperature. When testing a new ganache ratio, let the ganache stand at room temperature for 24 hours. The consistency of the ganache after 24 hours will give you an indication of how hard it will get. You can then add or reduce the amount of cream you add to the chocolate to get the desired consistency of ganache. 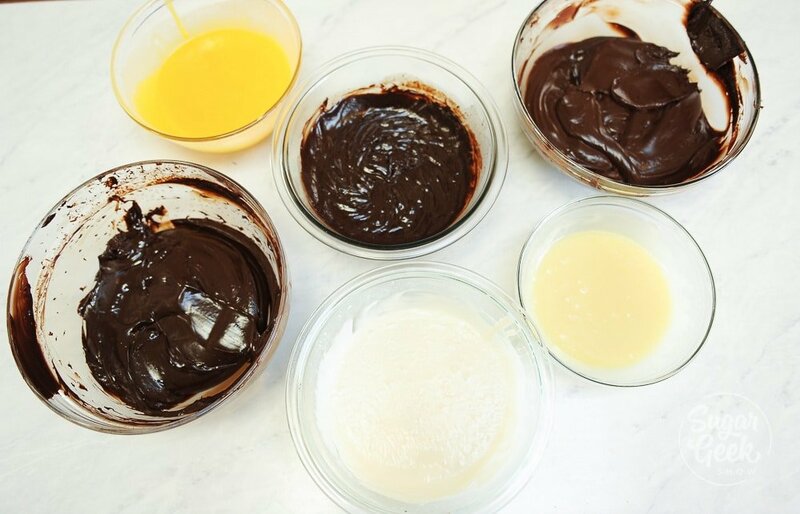 What ratio is best for chocolate ganache? A perfect ganache all depends on the ratio of chocolate to cream that you use. Ratio is a scary word for the baking newbie. I remember I totally did not understand what that meant at all. Basically, it just means how much chocolate to cream are you using. The first number represents chocolate, the second cream. I always work in oz because I’m bad at math. So for instance, if I’m making my go-to ganache recipe and I use 32 of chocolate, I’m going to use 16 oz of cream (2:1). In this ratio, there’s always twice as much chocolate as cream so if you up the cream to 12 oz, then you’d use 24 oz of chocolate to keep the ratio the same. Ganache ratios change depending on how you’re going to use it. I have listed below the ratios I use for my ganache. I only use semi-sweet dark chocolate or white chocolate (both from Guittard). 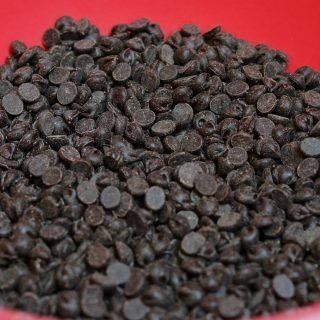 If you’re using a different brand and it’s not as thick or thin as you want it, just keep in mind, the darker the chocolate and the more cocoa %, the firmer it will set. This ganache uses equal parts of chocolate and heavy cream always stays a bit soft. It’s great to use for pouring over ice cream when it’s warm, using as a glaze for cakes or for a super creamy and soft frosting for filling your cakes and cupcakes. This soft ganache can also be whipped to make a whipped ganache frosting. This ratio is most commonly used in the cake decorating world. It set’s a bit more firmly than the 1:1 ratio. When you let the ganache cool a couple of hours to room temperature (peanut butter consistency) it’s perfect for frosting wedding cakes or sculpted cakes. I also like using this consistency for my sculpted cakes because when the frosting sets fully, it keeps a cake very stable. When the ganache is at room temperature it’s also the perfect consistency for rolling into truffles. *pro-tip: you can flavor your ganache by steeping herbs or spices in the cream. Tea makes for some excellent flavors in ganache. Milk chocolate is great for making ganache but because it contains more sugar and milk solids, it is not as stable as dark chocolate. You will need to use a bit more chocolate for this ganache to set firm. White chocolate doesn’t contain any cocoa to help it set, only cocoa butter so you need to use a lot more chocolate to get it to set properly. I use a 3:1 ratio but I know some people go as high as 4:1. Did you know that white chocolate ganache doesn’t sweat and is ideal to use in really hot environments like Florida, the Caribbean and Texas? Cynthia White from CAKED By Cynthia White uses white chocolate ganache exclusively for her high-end clients and never has issues with cakes melted or shifting in the super hot weather. Water ganache is ganache made with water instead of cream. The taste is still just as good but with no added dairy. 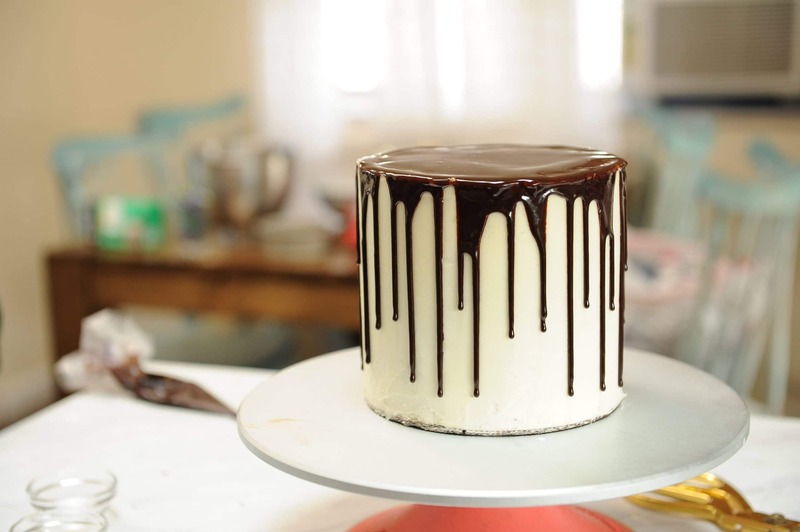 Water ganache makes the most perfect little drips for drip cakes. Stir in your water until combined and smooth. Add in colorings as desired. Let cool to 90 degrees before piping onto the cake or if using to frost your cake, let thicken to peanut butter consistency before using. What Kind Of Chocolate Is Best For Ganache? 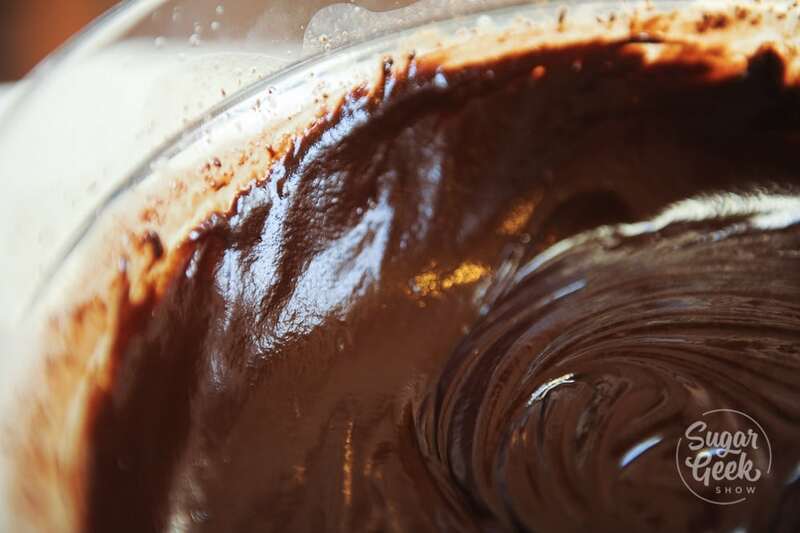 The basics of making ganache are actually very simple. Heat your cream, pour it on the chocolate and mix. So why do people have so many problems with ganache? Chances are, it’s probably the chocolate you’re using. I know that when I first started baking I did not know that chocolate actually came in many many MANY different forms. But don’t worry, it’s not as scary as it sounds. Basically, the higher the quality of chocolate you use, the better your ganache is going to taste. It means leave the Hershey’s kisses and toll house chocolate chips in the cupboard and get yourself some real chocolate. 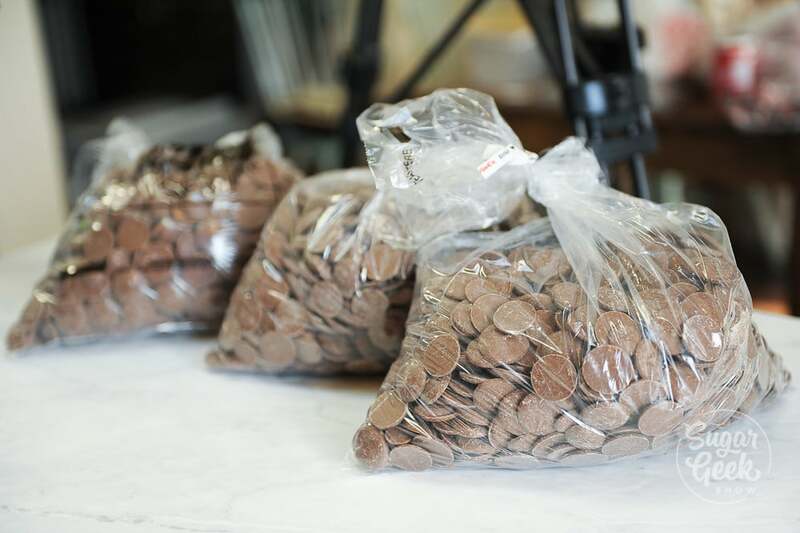 Chocolate candies often have other ingredients like stabilizers that STOP them from melting so they hold up in packaging or don’t lose their shape during baking. Really cheap chocolates like chocolate bark don’t taste very good because they have a lot of fillers like vegetable shortening instead of cocoa butter. If the chocolate doesn’t taste good, the ganache isn’t going to taste good. You can buy chocolates in bars at the grocery store but that can get expensive. Your best bet is to look for good quality chocolate either from a restaurant supply store or cake decorating store near you or you can buy on Amazon. 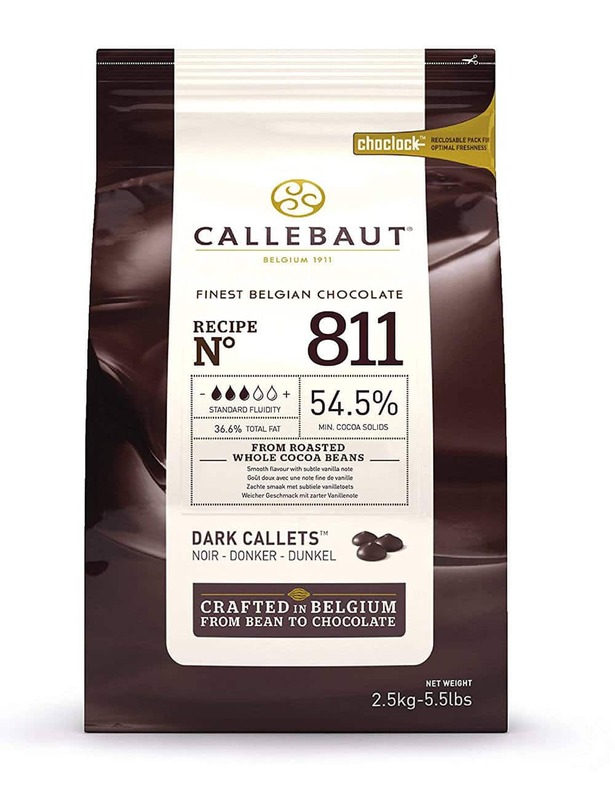 Look for a chocolate that’s at least 53% cocoa like Callebaut Chocolate (it should list it on the label). I use Guittard semi-sweet dark chocolate wafers because I can buy them at my local Winco in bulk and they are a good price. 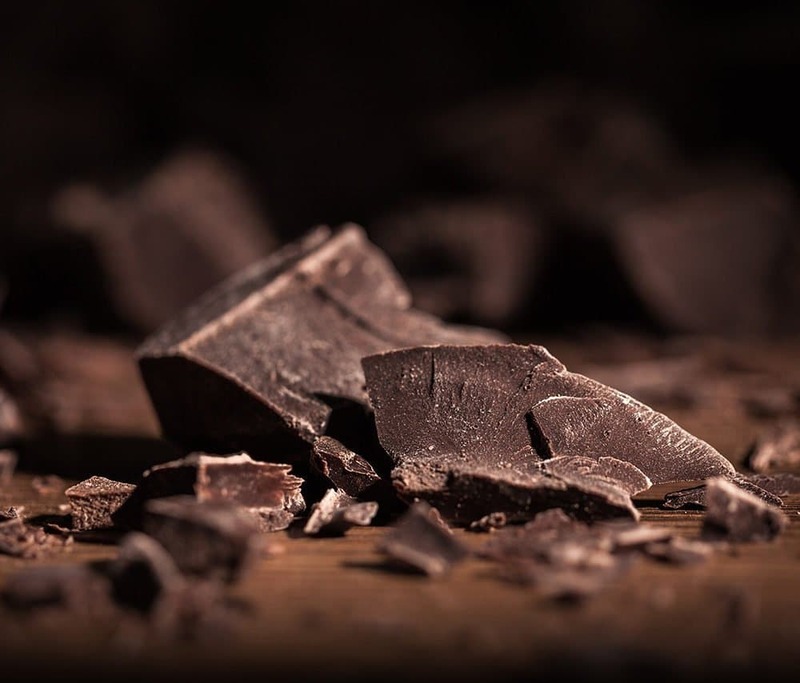 If you can find a place near you to buy in bulk or in large bars, that’s the best for your money because chocolate is heavy and can be expensive to ship. Plus I always seem to be out of chocolate when I need it and I never have time to order! If you have any lumps you can re-heat the whole thing in the microwave for 30-second increments until it’s smooth or you can use an immersion blender to make it super creamy. 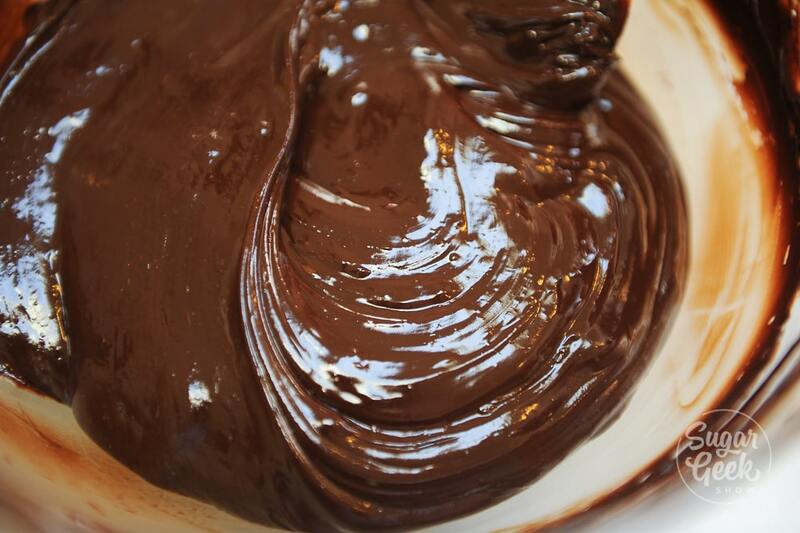 If your ganache is breaking (oil separating from the chocolate) you can whisk in a tablespoon of warm water or milk. Keep adding warm water a tablespoon at a time until it comes together. 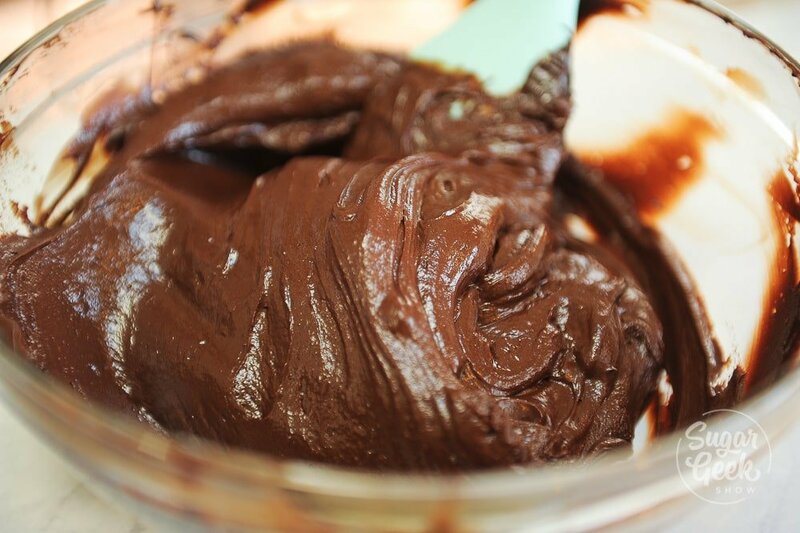 Ganache can get grainy from whisking when the milk is too hot. Always let your chocolate/cream stand for 5 minutes before whisking. 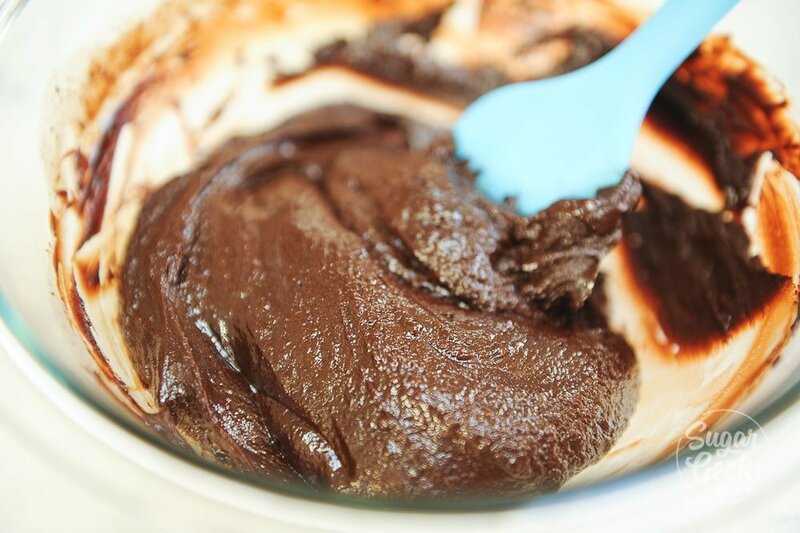 If your ganache is grainy, just re-melt the whole thing over a double boiler and let it re-set. If you don’t re-melt it, the ganache will have a very bad mouthfeel. If your ganache is too thin and isn’t setting, add more melted chocolate and whisk to combine. I would start with 2oz and see where you’re at before adding more to avoid making the ganache too stiff. If your ganache is too stiff you can add 1oz of warm cream to loosen it up. Ganache can be left at room temperature for 48 hours, refrigerated for 1 week or frozen for 6 months. Warm ganache up in the microwave in 15 second bursts or let it come to room temperature naturally. Be sure to watch the video below on how to make chocolate ganache and I hope this post has helped you have the confidence to go forth and make some ganache! I swear it’s not scary and if you have any questions at all, just leave them for me down in the comments and if you’re looking for a community of cake decorators to help you at any time of the day, join our facebook group! 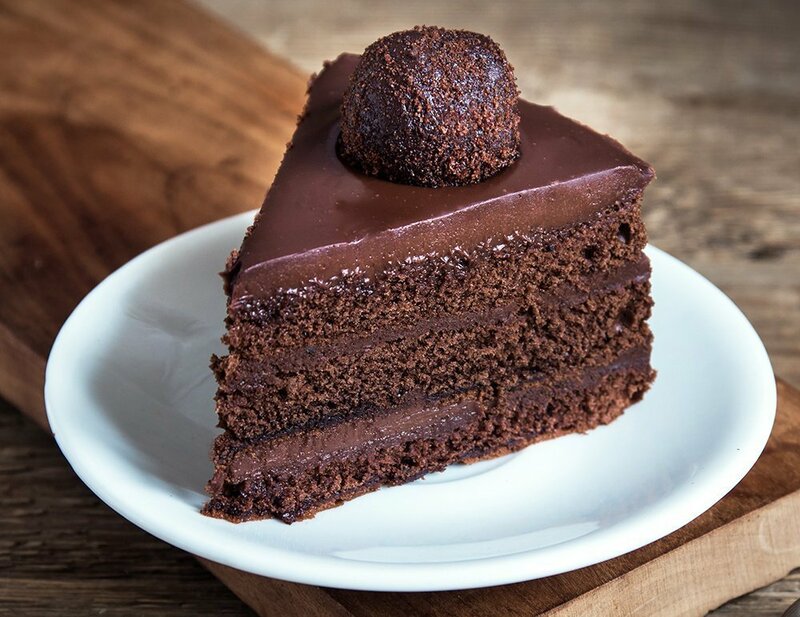 How to make a great ganache recipe and how to use it in it's various forms for a ganache drip, piped ganache and ganache for icing a cake. Heat cream in a sauce pan until steam starts to rise from the surface but isn't boiling yet. Pour hot cream over the chocolate, push the chocolate down so that it's all under the surface of the cream and let it set for 2 minutes. Whisk the cream and chocolate together. Add salt and vanilla and whisk. Sometimes it all won't mix together and you'll be able to see a couple lumps. If you have lumps, put the bowl in the microwave for 30 seconds to completely melt all your chocolate, otherwise this can ruin the ganache later when the chocolate re-crystalizes. Freshly made ganache is great for piping a drip around a cake. For piping ganache or frosting a cake, let the mixture sit at room temperature until it's thickened to peanut butter consistency. For truffles, let your ganache sit overnight at room temperature. Ganache can be kept in the refrigerator for 1 week for frozen for up to 6 months. Don't put your ganache in the refrigerator. If you put it in a cake and then refrigerate it ,is the ganache gonna be like a rock when client serves it? Sorry! don’t make it much , and just want to be sure. I used Ghirardelli semi sweet chips. left out over night and it is not at the truffle consistency. More like a sour cream thickness. can it be saved. Callebaut is truly the best! Use others and see….experiment… make a small amount with 3 or 4 different kinds of chocolate and you’ll understand….. I also add a small amount of brandy or chambord or another after dinner liquor…. Another trick….you can beat ganache till fluffy for another variation….put it on a cake as you would a 7minute frosting! 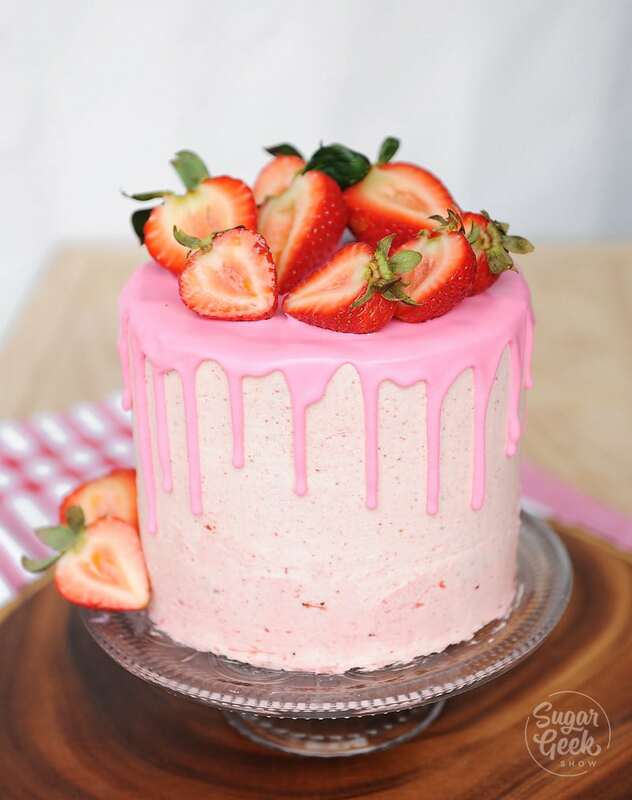 And yet another trick…..melt 1/3 a cup of jelly (apple, orange, peach, and add 1/3 cup of alcohol such as Vodka or brandy….heat till thin and paint each cake layer before adding frosting….fruit adds richness and alcohol cuts sugary flavor….. I have had the problem when using ganache as a filling for a cake. I live in Florida so I have to refrigerate the cake. After taking it out to let it sit for 2 hours to come to room temperature often times the cake and buttercream on the outside of the cake are fine but the ganache filling is still like fudge. It seems to take a long time to get the ganache filling to soften at which time I’m concerned about the buttercream being out too long. Would appreciate your help. Would the ratios be the same if I’m making a white chocolate ganache? Is this recipe (with semi sweet chips/wafers) the same that you used for the bark on the Lumberjack Cake? Ive been reading about different types of ganache for different uses so I wanted to make sure. Im assuming yes, since it was included in that tutorial but wanted to make sure! Thank you so much!! Yep! This ganache is great for sculpted cakes! I’m just wondering how you get it so fluffy ? Do you put it in the mixer after it has cooled ? Thank you, for the great tutorial. I use the large blocks of Callebaut; do you have suggestions for how to chop it into manageable pieces? I love the taste but chopping it is problematic. When I was in pastry school we used a chefs knife to just chop it into chunks. I hope that helps. I am new to ganache! I have made it before but not to sure about the application. Can it be cover in fondant? Do you typically use it as a filling and as crumb coat or would that be too much chocolate (if there is such a thing)? 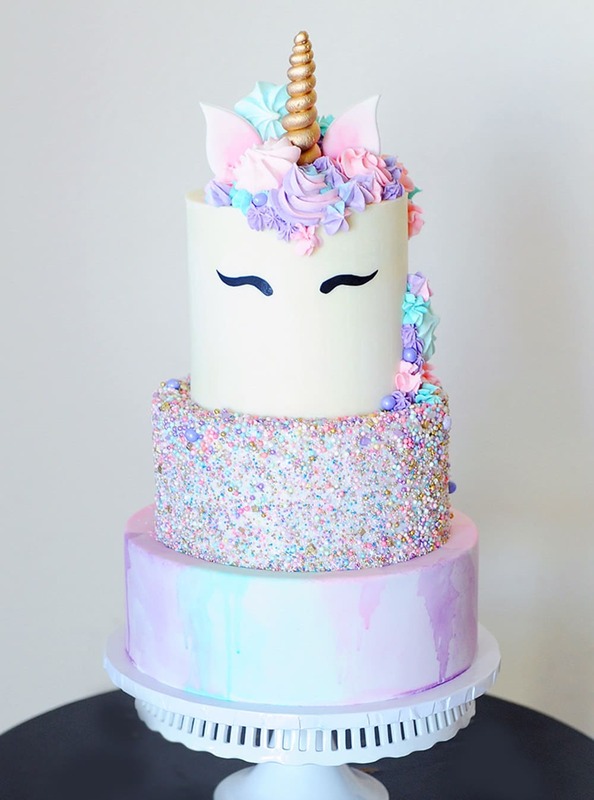 I saw another question where she used buttercream and ganache, can you put ganache over buttercream? I’m sorry for all the questions like I said I’m very new to it. Hi, what would be an ideal white chocolate to use for a white chocolate mouse that will be in a chocolate mirror layer cake? Btw, love your channel…It is super helpful! Hi Linda, I think you might be confused about the steps. I stated to not refrigerate ganache in order to get it to set faster. Let it set at room temperature. You can however store leftover ganache in the fridge if you’re not using it. I hope that clears it up for you. 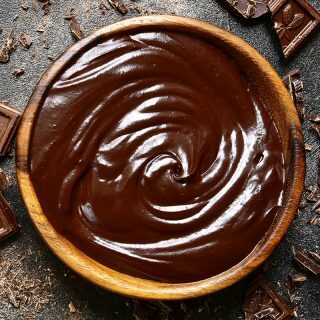 Hi, Can ganache be made using dark chocolate and water instead of cream? I have made your water ganache recipe with candy melts before with great results, but I am hoping to make a dark chocolate ganache with water also, are the ratios the same as in this recipe if I am using water? I want to make your Lumberjack cake and wanted to know the quanties of ganache used please. Just want to confirm that you are weighing your cream, not measuring in fluid ounces, when you direct to weigh the ingredients? Thank you! What a helpful video. Want to run out to winco right now and start making and playing with ganache. I have made the mistake of using a measuring cup with my chocolate so I’m glad I found you. I’m a real novice but love baking. We’ve all been there! Ps, WINCO is aweeeeesome!!! Hi there, so what’s the ganache ratio for callebaut dark chocolate (54%)? Ganache would be used for under fondant. For like a 3D cake. When making the lumberjack cake, what ratio is the ganache you used for the outside of the cake to look like bark?! I’m about to buy chocolates for making ganache. Do you use Guittard semi sweet dark chocolate wafers (couverture 66%) or Guittard A’ peels dark or semi-sweet chocolate here in the recipe ? Okay ! Thanks for the informations. Am I right with this chocolate ? If not , what should I do ? Waiting for your reply ! It’s getting set but I don’t know will it result in frosting ganache. Hello Liz! If I am making firm setting ganache to fill and cover the cake to be used under fondant, how many days in advance can I do this before customer pick up? Will the fondant protect the ganache? Would I have to refrigerate the cake and if so, for how long? I usually fill and crumbcoat my cakes 3 days in advance using buttercream, final b/c coat 2 days in advance, final decorations/stack tiers 1 day in advance then fridge overnight before transport the day its due. May I use the same timeline for ganache? Thanks! Hi, i have found your ganache recipe for this one and water. If i use the 3:1 ratio for white chocolate would it 3:0.5 as im using water instead of the cream, so, 300g white chocolate to 50g water? 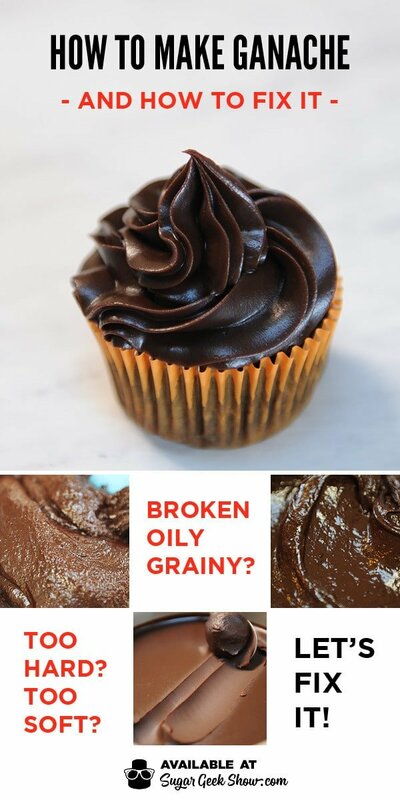 What ratio do you use when making like frosting on cupcakes in photo. How long does it have to cool to set up. I think I was impatient and I cooled a bit over ice, frosting got really hard even at room temp. Has great flavor with high quality chocolate. How much white chocolate ganache would I need to drip and cover the top of an 8″ cake?